Get organized with this traditional dresser and mirror combination. 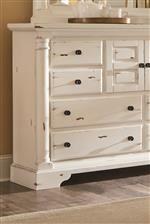 The dresser boasts shaped edges and moldings for a tastefully dramatic look. Add style and function to your bedroom with the rectangular dresser mirror. The Gramercy Park Traditional Dresser with Panel Doors and Drawers and Mirror with Solid Wood Frame Set by Progressive Furniture at AHFA in the area. Product availability may vary. Contact us for the most current availability on this product. Handles & Hardware Bronze Hardware Knobs with Backplate. Case Detail Scalloped Bracket Foot Base. Drawer Suspension Metal Drawer Guides. 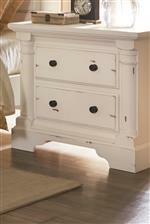 Tasteful drama is a promise with this traditional antique style bedroom collection. These bedroom pieces focus on ornate edges and creative craftsmanship to bring a unique touch into your home. The storage pieces feature solid wood drawer construction and metal guides promising smooth operation for years to come. Beds boast a mantle-inspired headboard with raised panels for a special touch. See the potential in your bedroom space and make over your home with this decorative bedroom collection. The Gramercy Park collection is a great option if you are looking for Traditional furniture in the area. Browse other items in the Gramercy Park collection from AHFA in the area.